The family court appoints CASA volunteers to act as a consistent, encouraging adult during the most traumatic time in a child's life - after they are placed in foster care.  CASA volunteers are not foster parents; they are advocates who guide the children through the court process while they are living in foster care. Your help is needed now more than ever. Typically 300 children enter foster care each year in Atlantic and Cape May Counties who do not have an advocate. You can change that by becoming a CASA volunteer. Answer these 5 questions, then click the blue button to send your request to learn more.